Napier is a coastal city on the North Island of New Zealand. It is the primary trade seaport for northeastern New Zealand as well as NZ largest wool center. It has also developed as a large grape and wine production along with the apples, pears, and stone fruit. Napier Port is the 2nd largest shipping port for tonnage in the area. The port is open 24/7 365 days a year and is equipped to handle all kinds of cargoes. Products that are shipped consist of Fruits, Wool, Frozen meat, Wood pulp & occasionally Timber. The facilities include several berths and crane operation for loading and unloading. The last purchase of the 5th harbour crane was in 2012. The port sees many different cargo vessels but also commercial cruise vessels as well. Well known commercial cruise vessels such as Princess cruise line, Holland America, and Viking cruises can be seen in this port, as well as many others. This port will continue to service the area for many years to come and meet the demands of the future. Napier’s transportation is a combination of ships, rails, and roads. Much of the exports are shipped from the port on cargo vessels but there is some shipping to local areas by rail and truck. Anything that people need a building or container such as water for livestock, a recycled shipping container can be the answer. There is always something to see and do in Napier. Some of the tours are half day tours to accommodate cruise ship patrons while they are in port. Also, there are various events and festivals that you can participate in as well. 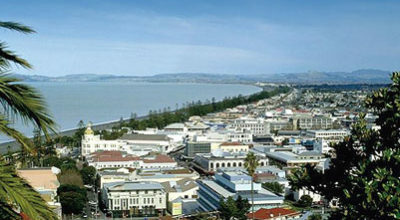 Napier New Zealand’s port is an extremely active port and the second largest shipping port for the area. It also handles commercial cruise ships as well as cargo ships and will for many years to come. With all the cargo shipping that goes on, there are plenty of ways that shipping containers that are recycled can be of value to the area of Napier and its residents.